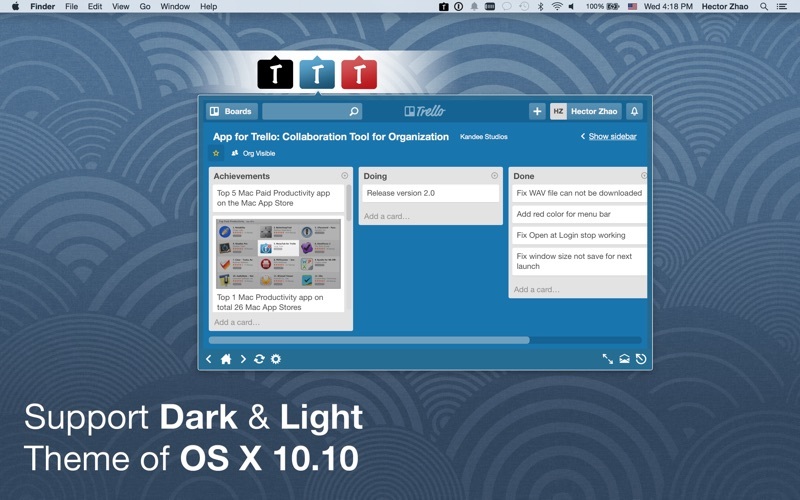 App for Trello: Collaboration Tool for Organization allows you to quickly access your Trello Boards directly from your Mac's menu bar. #1 Trello app on the App Store! #1 Mac Productivity app on the App Store in over 40 countries! 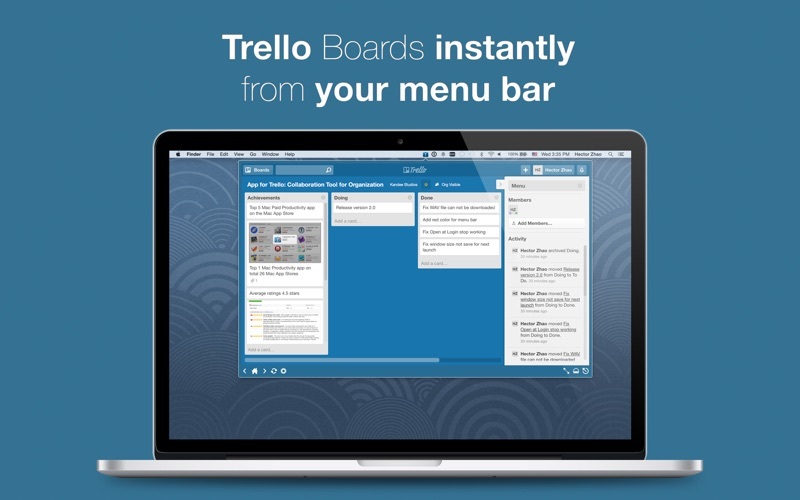 * Instantly access to Trello via your Mac's menu bar. 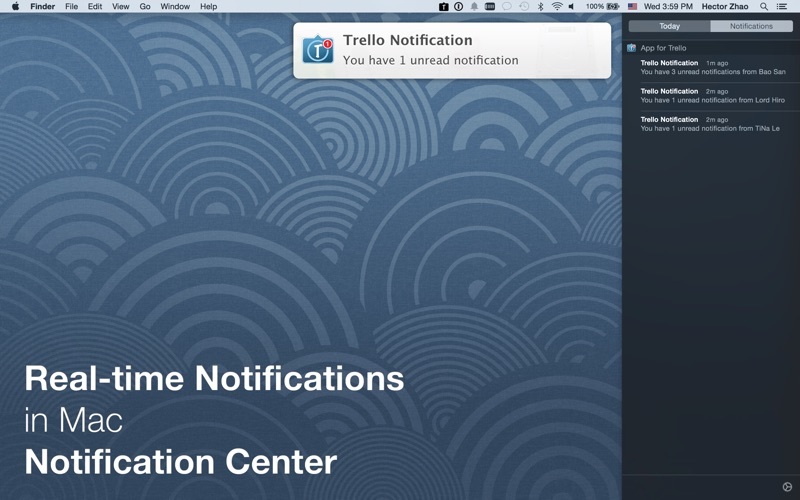 * Real-time popup Notifications will be shown on your Mac Notification Center. * Reminder for unread notifications after every 3 minutes and can be adjusted from Settings. * Default Hot Key: Control + Shift + T and fully controllable to match your own way. * Fully support OS X Yosemite. 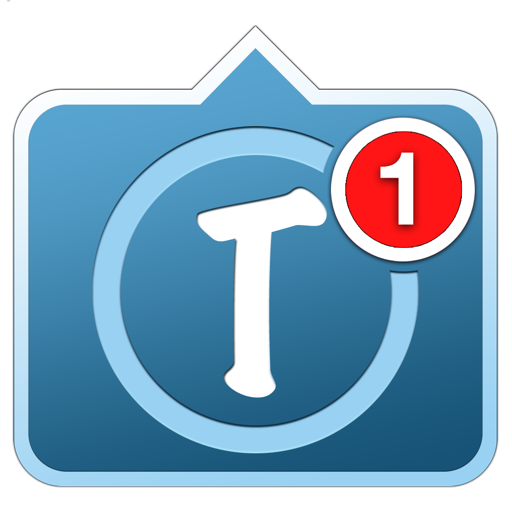 Never miss your Notifications on Trello again. ***** JustAnomad: "It’s much more convenient to use Trello on a separate window and while you can do this with any browser, it’s nice to have it on the menu tab to view no matter what you’re doing. p.s. very responsive to customer feedback. I suggested a design change for the icon (previously non-transparent with boxed borders) and it was reflected in two weeks. awesome!" 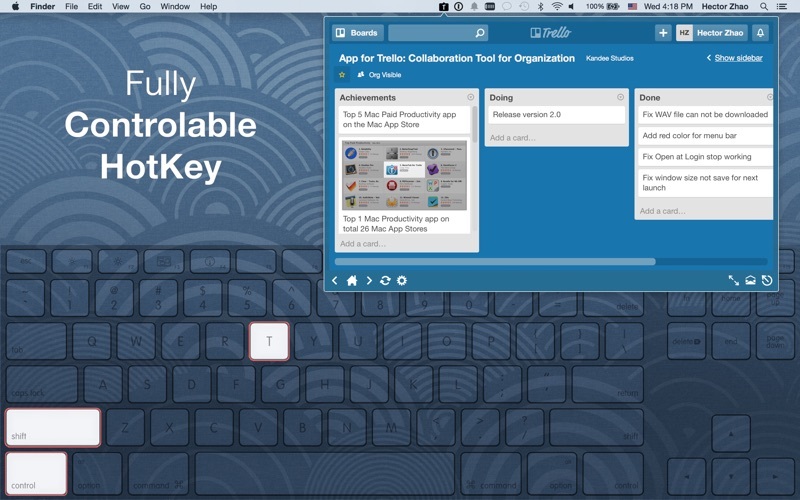 ***** RobyWei: "I’m looking for any tools regarding Trello in Mac. MenuTab for Trello is convenient tool to me. I won't need to always keep my browser opened for trello." ***** Chrisjclay: "I love Trello, but I’m used to using it on my iPhone and iPad. On my new Macbook Pro I’ve missed being able to quickly access it… I thought MenuTab would simply add a shortcut that would launch Trello in Safari, but it’s even better - it feels like an independent app that you can instantly reveal or hide by clicking the icon in the menu bar." ***** Darren 22: "This is a great app for productivity as I no longer have to maintain a browser tab for Trello. It also uses the Notifications system which basically lets me know instantly if someone in Trello has pinged me. For the price of this app, theres really no reason not to get it." 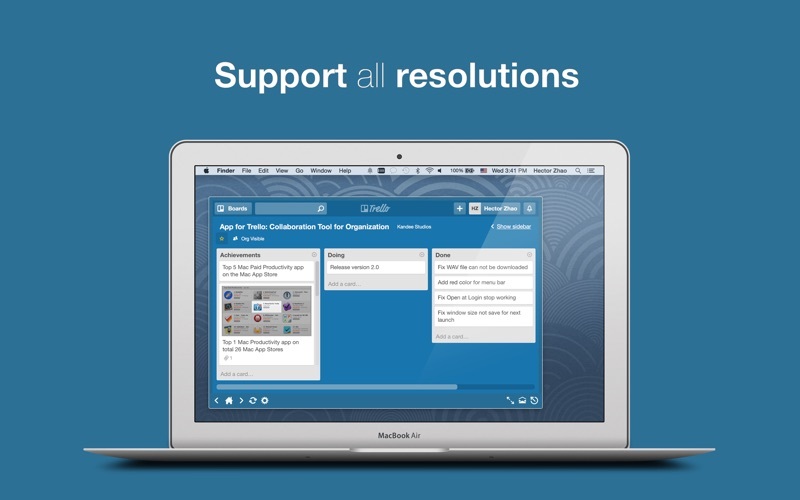 * App for Trello: Collaboration Tool for Organization is a 3rd party application for Trello and is in no way endorsed or affiliated with Fog Creek Software. * Trello is made in New York City by Fog Creek Software. - Bug fixes: fix issue 'Attempt to Restore Connection' dialog shown when Internet connection is slow, the app should automatically reconnect without requiring user action(s). - Improvements: allow to keep window open, turn on/off this feature in Settings > Auto-hide window. Please note that "Drag & Drop" files into Trello Cards is under construction and we're working our best to bring this to you as soon as possible. - Improvements: add button to Hide window. - Please contact hector@kandee.us.com, we're human, not auto-bot, and our support is 24/7. We always love to stay by you. Major update from MenuTab for Trello: we have changed the name to App for Trello: Collaboration Tool for Organization to avoid conflict and misunderstanding of usage. - Bug fixes: fix issue Open at Login not working on OS X Yosemite. - Bug fixes: fix issue Window Size is not saved for the next launch. - Bug fixes: fix issue WAV file is unable to download. - Improvement: color notification when new Notification comes in, the Icon will change to Red if new notifications come in, and return back to original color once you open the app to check it. - Please restart MenuTab for Trello after the 1st time launch by using Activity Monitor to stop the running process. If you're facing any issue, please contact us as hector@kandee.us.com, our support is 24/7. We always love to hear from you. Next update to fix issues will be submitted right after your feedback. Thanks! - New feature: Hot Key can be modified, please go to Settings and adjust it to make your own better experience. - Bug fixes: improve layout, remove all unnecessary controls and make more space for useful content. - Bug fixes: centralize all settings in one place to avoid distraction. - Please let us know if you face any bugs, we love to make the app better for you.